What could be more eye catching than ring-shaped pasta? Tortellini (read here other news) those little circles of meat or cheese-filled pasta – livens up any plate. 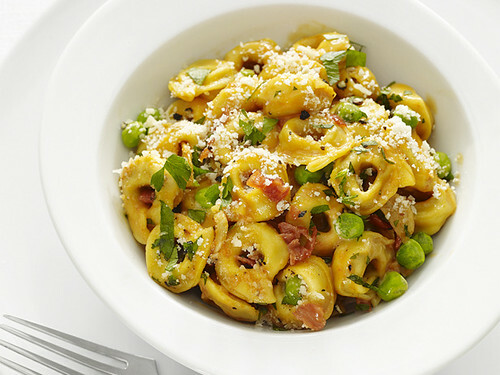 To make the tortellini you need salt, 1 pound meat-filled tortellini, 2 tablespoons extra-virgin olive oil, 4 ounces prosciutto, finely chopped, 3 cloves of garlic, thinly sliced, 1 tablespoon tomato paste, ¼ cup heavy cream, 1 cup peas, 2 tablespoons fresh parsley, and ½ cup grated parmesan cheese. To prepare you first heat a large skillet over a medium flame and heat oil and prosciutto and cook until it’s crisp. Add 1 cup of pasta water and simmer for about 3 or 4 minutes and add cream continuing to simmer until thickened. Just before the tortellini is done add the peas to eater and cook until they are tender. Drain the pasta and the peas and place in a skillet and coat with the sauce and add parsley and sprinkle with cheese.